Last weekend I had to make a quick trip into the city, which luckily coincided with a Purim lunch my mother prepared for the family. She decided to make a Maza, a meal consisting of many small dishes––salads and finger food––often served after synagogue on Saturday. 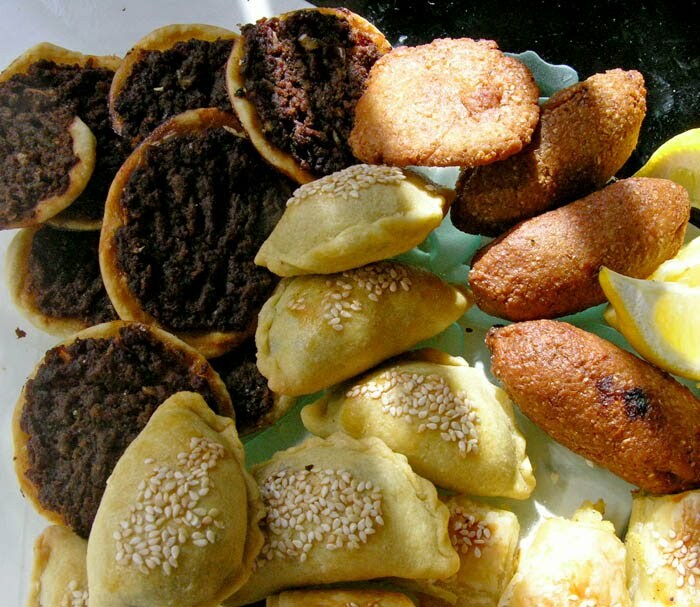 These are some of my very favorite Syrian Jewish foods, some of which are quite time consuming and difficult to cook so I've never learned to make them. On the plate above you see three heavenly meat dishes. There is the round pizza-like Lahma b'Ajeen, in which the meat is flavored with sour tamarind concentrate. I have tried my hand at these and they came out quite well. The torpedoes, Kibbeh, are a shell made of ground bulgur with a spicy meat filling and deep fried; it takes a good deal of skill to make them. And finally, little meat turnovers, called Sambousek. 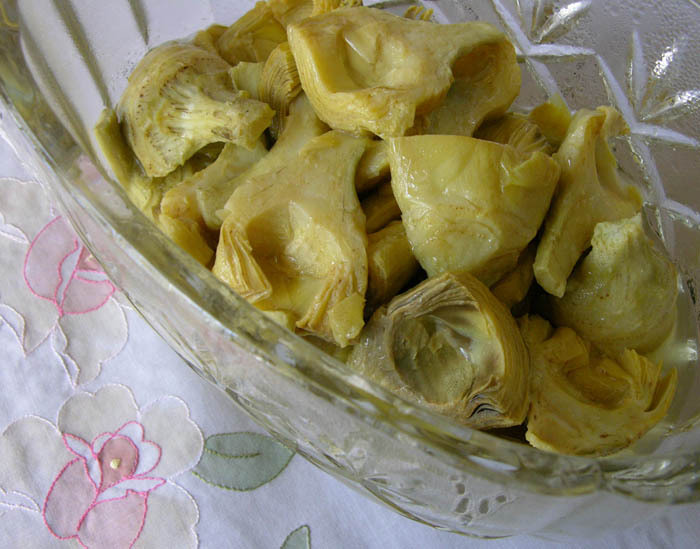 There are always several vegetable dishes at a Maza, and here are artichoke hearts with a lemon juice and olive oil dressing. The smoky flavor of eggplant salad is one of my favorites, which I make during the summer when the eggplants are ripe. I posted a detailed recipe for it here. 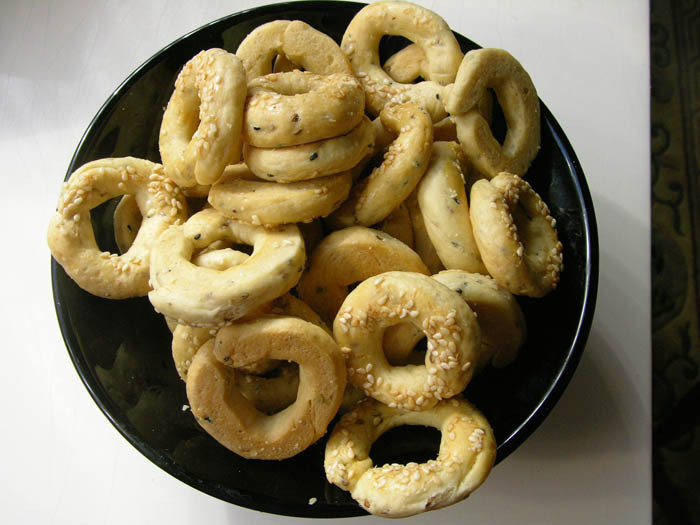 Another Middle Eastern delight are these crisp savory biscuits, Ka'ak. They are flavored with anise, coriander and nigella seed, which gives them a particular spicy flavor. I've tried making these too, and the main difficulty was getting the correct amount of crisp dryness without the rings becoming hard. They are very delicious, and much too addictive. This last dish is delicious, a salad made with bulgur wheat flavored with sour tamarind paste or pomegranate concentrate. It's always a hit when I take it to a pot luck. The bulgur wheat is soaked to soften it, then mixed with a dressing. It is quite simple to make. Its name, Bazargan, means "of the bazaar". The recipe comes from Claudia Roden's The Book of Jewish Food, with amendments from my mother. I like to make this a few hours before serving so the flavors soak well into the bulgur wheat. Put the bulgur wheat in a large bowl and cover with plenty of cold, slightly salted water. Leave to soak for 1/2 to 3/4 hour, or much longer if coarsely ground, until tender. Drain and press out excess water. Beat the olive oil with tamarind or pomegranate paste, add lemon juice, onion, tomato paste and spices and beat well. 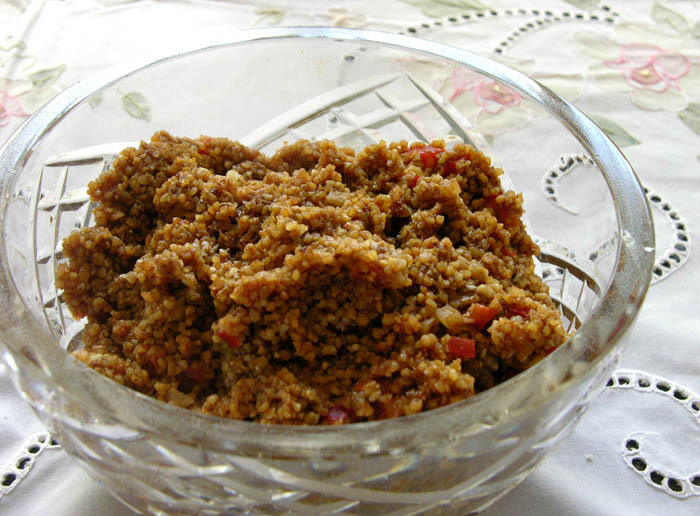 Place softened bulgur in a serving bowl, pour the dressing over and mix well. Taste for salt. Add the nuts and parsley when ready to serve. This all looks and sounds wonderful! The Ka'ak biscuits remind me of Italian taralli pepper cookies. 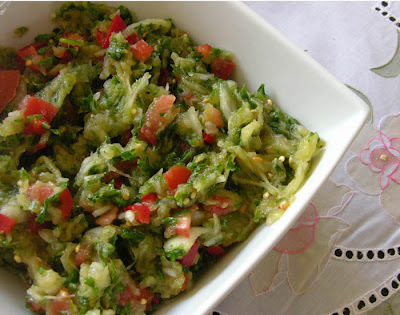 The eggplant salad recipe sounds do-able for me; will definitely try it. Brainiac, I'm not sure I've tasted those Italian cookies, but they sound as though they could be similar. I hope you like the eggplant salad; it has a marvelous smoky flavor not like anything else. Drooling! This all looks so wonderful. I love Bulgar and Tamarind sauce too, so will be sure and try your Bazargan. Thanks for sharing the splendor! Bazargan is also wonderful if you add pomegranate seeds. Nancy, you're welcome. I hope you like the Bazargan. and A., I've never used pomegranate seeds, but will look for them and try it out. Thanks for the tip. I've made ka'ak from Claudia Roden's book, and am happy that mine look much like yours! And you're right, they really disappear. Is the nigella seed the same as our love-in-a-mist, or a different plant? Susan, I believe that nigella seed does come from love-in-a-mist, but it is sometimes called onion seed, I don't know why. Boy am I hungry for all this delicious food! That last bulgur salad sounds amazing, I love anything with pomegranate molasses! A New Painting: "Blue Bolts"
A New Textile: "Green/Yellow Ground"
A New Painting: "Red Teeth"
A New Painting: "Three Openings"
A New Textile: "Zippity Blue"
A New Painting: "Banded Red"